The U.S. Fish and Wildlife Service has listed the “Rufa” population of Red Knot (Calidris canutus rufa) as a threatened species under the Endangered Species Act (ESA). One of the two sub-species of Red Knot occurring in North America, the Rufa subspecies breeds in the Canadian Artic Region and migrates along the east or Atlantic coast of the United States. The other sub-species, Calidris canutus roselaari, migrates along the Pacific Coast and breeds in Alaska and the Wrangel Island in Russia. The current status of the Rufa Red Knot under the ESA is “threatened”. This means the species is likely to become endangered in the foreseeable future throughout its range. The main factors leading to the Red Knot’s listing include the lost and alteration of habitat across its range due to land conversion and climate change. 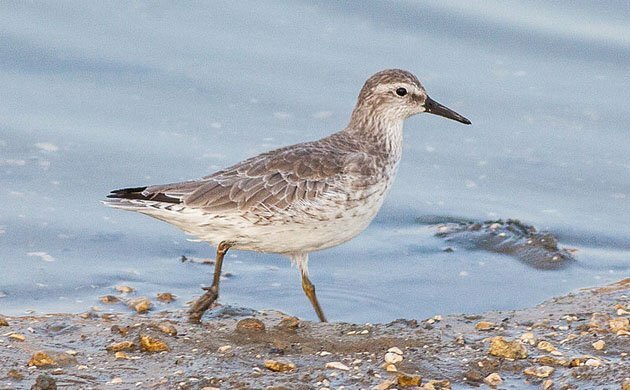 During both the northbound (spring) and southbound (fall) migrations, knots can be found anywhere along the coastal and inland U.S. migration corridors from Argentina in the Southern tip of South America to Canada. In the spring, key staging and stopover areas include Patagonia, Argentina; eastern and northern Brazil; the southeast United States; the Virginia barrier islands; and Delaware Bay. Perhaps the most important threat to the Red Knot is climate change. Subtle environmental changes increase the likelihood of mismatches in the timing of its food supply. Adverse effects from altered timing have been observed at migration stopovers in some years. For example, in the Delaware Bay, warming coastal waters can cause horseshoe crabs to lay their eggs earlier than normal; conversely, more intense and frequent coastal storms can cause late spawning. In both cases, knots, which feed on the crabs’ eggs, can miss their peak refueling opportunity. Additionally, ocean acidification and warming coastal waters are likely to affect the clams and mussels that the knot feeds on in other areas along the Atlantic and Gulf coasts. The knot’s breeding grounds in the Canadian Arctic are experiencing pronounced effects from climate change. Some of its tundra breeding habitat is changing to less suitable habitat due to warming temperatures. The ability of knots to successfully raise their chicks is very sensitive to snow conditions, the availability of insects as food, and the presence of predators, all of which are affected by climate change. Red Knots have already lost more than 80 percent of their coastal habitat in Florida, New Jersey, and New York. From North Carolina south to Texas, just under half of beaches are developed. Additionally, about a third of knot habitat in the United States is still available for development, and winter and stopover habitats in the wintering grounds of Argentina and breeding grounds of sub?Arctic Canada face ongoing and proposed development. Where suitable habitat exists, sea level rise is expected to increase efforts to stabilize the shore and protect coastal development with hard structures, such as sea walls and jetties. These will eventually eliminate beach habitat and interfere with the creation of new beach habitat. Protecting a species under the ESA provides a means for federal, state, local and private organizations and landowners to work together to restore an animal or plant to ecological health. Listing will indirectly enhance national and international cooperation and coordination of conservation efforts, enhance research programs, and encourage the development of conservation measures that could help slow habitat loss and population declines. The listing rule evaluates the threats faced by a species and identifies the barriers to recovery. A recovery plan, developed after the species is listed, identifies the specific ways to recover the species and typically depends on the assistance of species experts; other federal, state and local agencies; tribes; nongovernmental organizations; academia; and other stakeholders. Governments and scientists from several countries where knots breed, stopover or winter are working to address the threats faced by the knot. 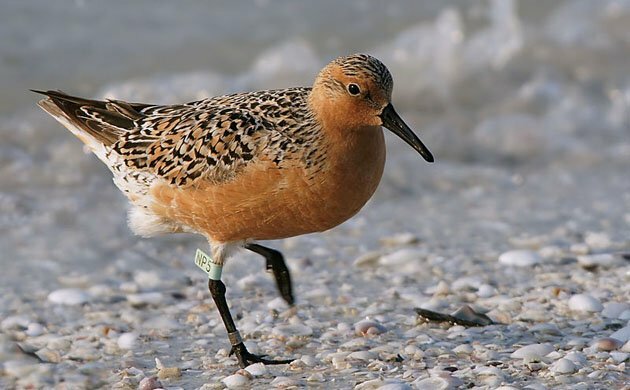 Many global, national, regional and state specific management and conservation efforts have been implemented to benefit shorebirds in general, including the Red Knot. Examples of actions underway to improve feeding conditions for knots and other shorebirds in the Delaware Bay include beach management to minimize disturbance and to reduce interference from gulls and Peregrine Falcons. Actions to conserve horseshoe crabs have included reduced harvest quotas, more efficient use of crabs as bait, closure of the harvest in certain seasons and places and the designation of a sanctuary off the mouth of Delaware Bay. In addition, biologists in the Carolinas and Florida are improving beach habitat by controlling invasive plants. In South America, several key Red Knot sites are becoming shorebird reserves, and regional efforts are including the protection of habitats in urban development plans. 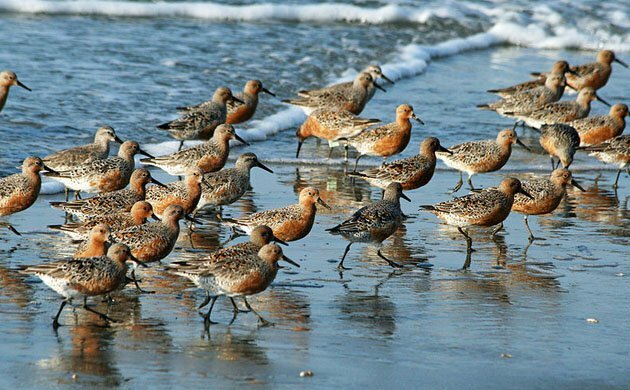 Having the Red Knot listed under the ESA means a legal obligation to consider potential harm and harassment effects from development projects in Red Knot habitat. This was not the case before the listing of the species. 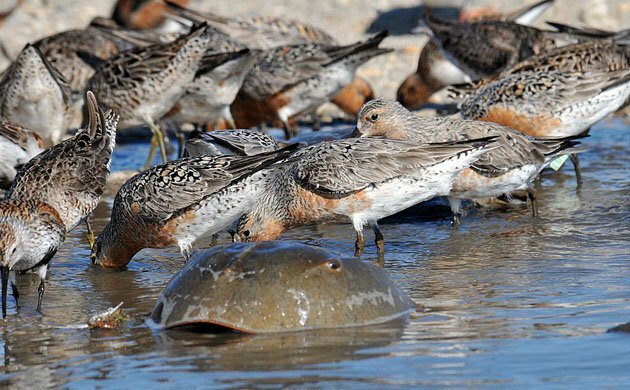 The Red Knot (in all its forms) is one of many species likely to be affected by climate change, but everything else I’ve read cites overharvesting of horseshoe crabs in Delaware Bay as the main cause of the observed population decline in the “rufa” subspecies. Habitat loss is of course always an important factor as well, with past habitat loss probably increasing their dependence on what remains. so I’m not sure the listing makes much difference. Where Are You Birding This Third Weekend of December 2014?